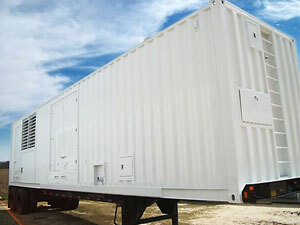 Powertainers are modified 20′ or 40′ ISO shipping containers. AMPS custom modifies used and single trip ISO containers to fit your specifications, equipment, and project requirements. Containers can be modified to provide up to an approximate average 30 dB(A) sound reduction @ 1 meter. Containers can be provided with or without chassis. Powertainers provide an economical way to make your equipment mobile.